Oca: What does it taste like? Sunset has low acid, medium sweetness, and medium density, traits that combine to produce a flavor a bit like carrot. I get asked a lot of questions about oca, but one is asked more commonly than all of the others combined: how does it taste? Most people don’t want a long answer, so it is easy to fall back on the standard descriptions like “lemony potato” or “potato with sour cream.” These answers satisfy those who aren’t planning to grow oca and just want a general idea of how it can be used, but they fall far short of exploring the spectrum of flavors and textures offered by oca. Bolivian Red has low acid, medium sweetness, and high density, traits that combine to produce a flavor very much like winter squash. I’ve tasted a lot of oca, particularly through this winter as we evaluated several hundred new varieties grown last year. I think that there are three important components of oca flavor: sweetness, acidity, and density. These combine to produce very different results. A variety with high sweetness, high acidity, and low density will be sharp and crisp, evoking comparisons to pie apples. A variety with medium sweetness, low acidity, and low density may taste a lot like carrot. 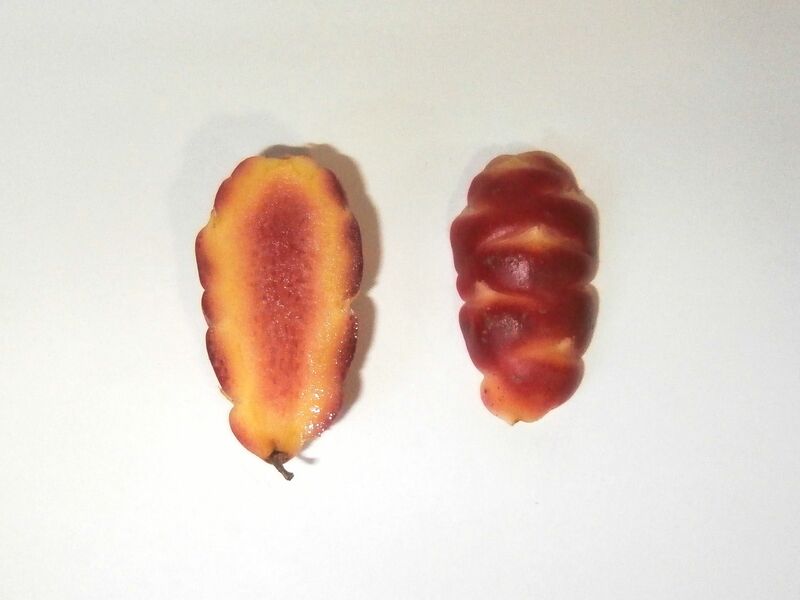 A variety with low sweetness, low acidity, and medium density can be quite similar to a potato, particularly if it also has some bitterness. A variety with medium sweetness, low acidity, and high density can be a lot like winter squash, with some developing strongly nutty flavors. Hopin is medium acid, low sweetness, medium density, traits that combine to produce the classic “lemony potato,” or “lemony turnip” flavor. The matter is complicated further by the change that oca undergoes after harvest. 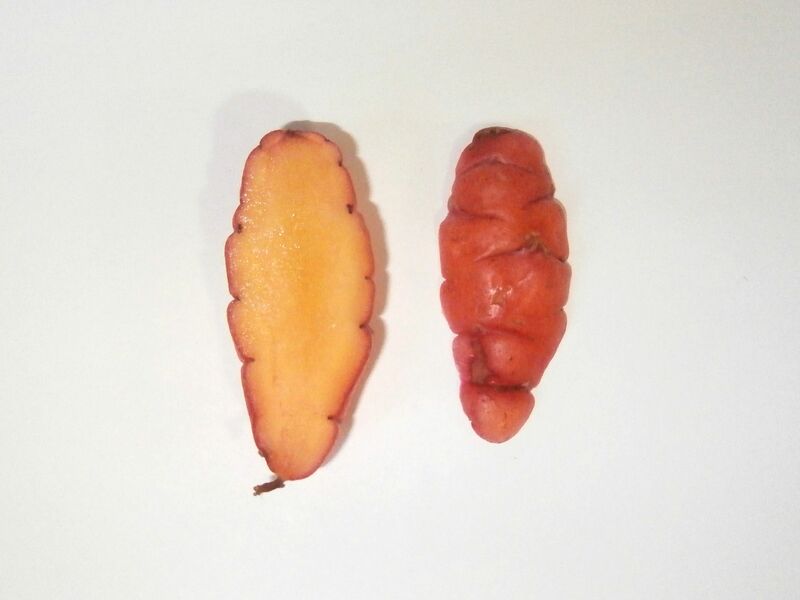 When exposed to sunlight for a couple of weeks (or when simply left in storage for about a month), oca undergoes biochemical changes that reduce acidity and, to a lesser degree, increase sweetness. So, a variety that comes out of the ground powerfully sour may be just pleasantly lemony in about a month, while a variety that is slightly sour may lose that character entirely. As a consequence, some varieties are best when freshly harvested, some after a period of storage, and others have great (but different) flavors before and after. 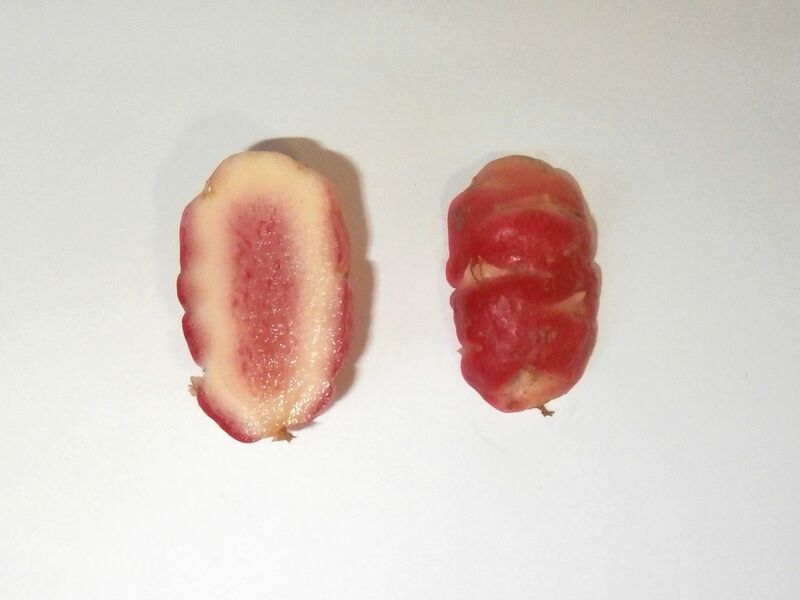 Redshift has low acid, low sweetness, medium density, and a slight bitterness, traits that combine to produce a result very similar to potato. All of these combinations have their charms, but the range can also be a challenge; different oca varieties aren’t necessarily interchangeable. A really acidic variety of oca (White, for example) can be used in a German style potato salad without adding any vinegar. It is a pretty unusual substitute for mashed potato and the acidity doesn’t pair well with every dish. The higher acid ocas are a somewhat unfamiliar combination of flavors compared to many common vegetables (sometimes, they are more akin to fruits) and so require a little more planning to incorporate into recipes. On the other hand, the low acid ocas are relatively versatile and slot right into recipes calling for ingredients as diverse as potato, carrot, sweet potato, and squash. So, what does oca taste like? That question is about as easy to answer as “what does wine taste like?” I have made some generalizations, but the spectrum of flavors in oca is wide and I feel like I have only just begun to explore it. New seedlings routinely turn up new combinations of flavor that I haven’t encountered before. 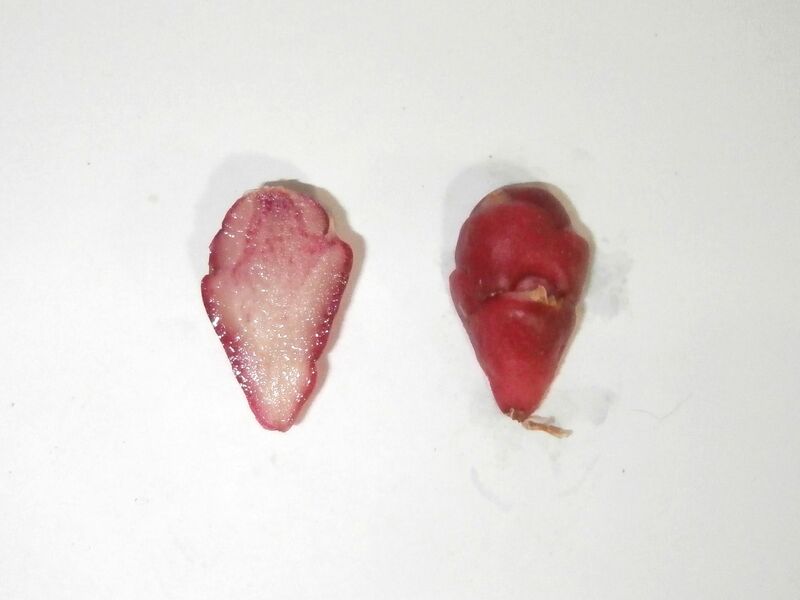 This entry was posted in Blog, oca (Oxalis tuberosa). Bookmark the permalink.